The Florida House of Representatives received the first two redistricting proposals from the public this week. You can check them at our new Plan Explorer page at http://mydistrictbuilderplanexplorer.wordpress.com/. The first submission is a complete congressional plan for Florida at http://mydistrictbuilderplanexplorer.wordpress.com/2011/05/27/hpubc0001-ortiz-nicholas-a/. The second submission is a partial State House plan for Brevard County area at http://mydistrictbuilderplanexplorer.wordpress.com/2011/05/27/hparh0002-alvarez-john/. 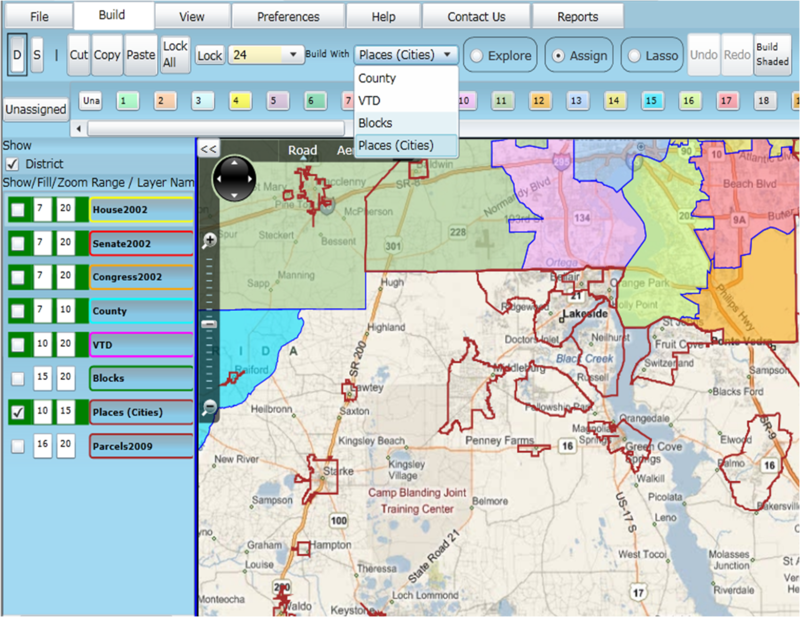 Keep a look out early next week for some new additions to www.floridaredistricting.org. With public meetings on redistricting about to begin throughout Florida, we are getting questions about what kinds of public testimony are appropriate at those public meetings. How can Floridians express the interests of their communities without running afoul of state and federal redistricting laws? How can Floridians talk about redistricting in a way that positively reflects the standards in law? While it is the goal of the Florida House of Representatives to consider any public testimony that is offered at the public meetings, via the House’s MyDistrictBuilder application, or through any other means, it is equally important to address the reality that – by law – some kinds of input simply cannot be considered in the crafting of Florida’s new state legislative and congressional district maps. We created the handout below, Guidance for Public Participation, as a reference to the concepts that are promoted and prohibited in federal and Florida redistricting laws. Guidance for Public Participation can also be found at www.floridaredistricting.org (or directly at http://bit.ly/mTaxBj). The handout gives general guidance for the kinds of public testimony that will be considered, and also the kinds of public testimony that will not be considered. For a greater understanding of these legal issues, visit the Legal Resources section at www.floridaredistricting.org. Our Redistricting Concepts & Terminology document at http://bit.ly/i1DpDu may also be a helpful guide. We hope you find the handout helpful, but please feel free to email us at mydistrictbuilder@myfloridahouse.gov if you have any questions. Note, recent changes to Florida election laws advanced the 2012 Primary Election by two weeks. See House Bill 1355 at http://1.usa.gov/kZgNXH, page 49, lines 1369-1370. Therefore, the Primary Election will occur August 14, 2012. As a result, 2012 qualifying for state and federal office (state legislature, congress) is also moved up two weeks. “Qualifying week,” as it is often referred to, will be June 4-8, 2012. We will be amending several of our public outreach documents to reflect the new qualifying week. If you utilize any of our old presentations for the purpose of public outreach, please make sure to note the change in the qualifying week. Qualifying for state and federal office occurs in the same week “in each year in which the Legislature apportions the state” (redistricting). See section 99.061 (9), Florida Statutes at http://bit.ly/eYpkBE. Building by Places (Cities) – So you want to build districts entire cities at a time? Now you can! Previously you could build by County, VTD or Blocks. You will see the Places was added to the drop-down menu. Quick suggestion – it is sometimes easier to see Places (city boundary lines) if you change the Bing Maps view from Aerial to Road. Data Grid – You can sort the Data Grid now by column. KMZ files – You can now Save and Open plans in KMZ format. KMZ is a file format that in the long-run will allow people to view your redistricting plans in multiple types of applications, and it also brings summary-level data along with the file. 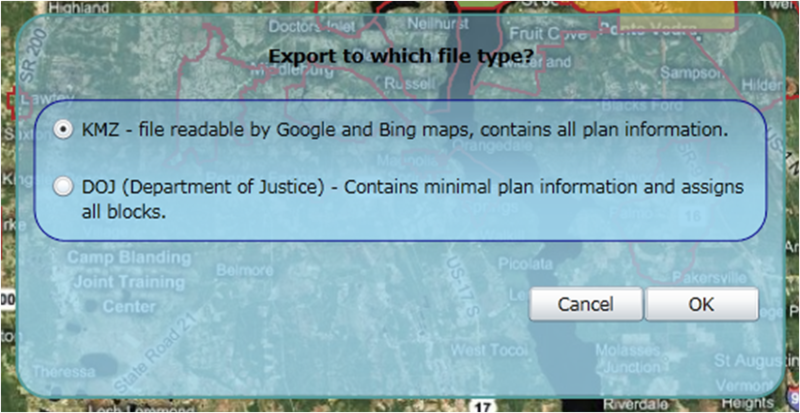 Note, when you click on Open System File, you now have a choice of opening Florida’s existing Congress, House and Senate maps in either KMZ or DOJ. 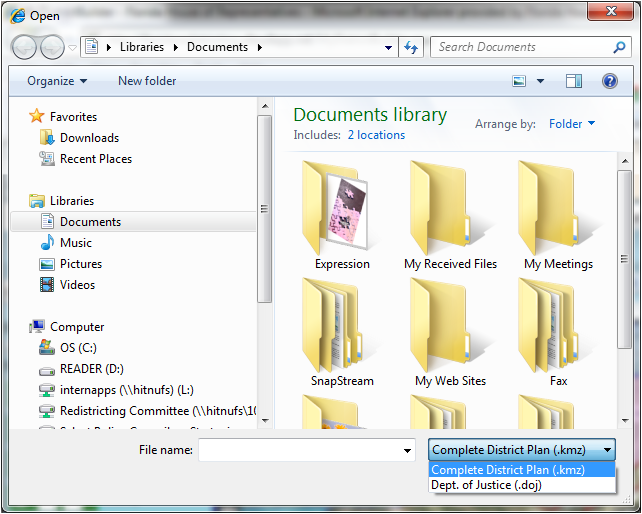 KMZ is also a faster option for opening a file. When you go to Open your saved redistricting plans, you will notice that you have a drop-down choice of either KMZ or DOJ. Submit – Yes, there is a Submit button now under the File tab. No, it doesn’t work yet. If you are ready to Submit a full or partial redistricting plan, we are ready to accept. Click Submit, and give us a call at the number that appears. The button will be fully operational soon. Preferences – There’s now a Preferences tab. At present there is only one feature there, a District button that allows you to set the ideal population for districts. This is especially useful is you are going to use MyDistrictBuilder for building local government district boundary lines. More features to come. Save and Lock – When you Save in the future, if you saved with the Lock on for one or more districts, the Lock is saved. As always, send us a message at mydistrictbuilder@myfloridahouse.gov if you have any questions, comments or suggestions. May 19, 2011 • 11:31 pm Comments Off on Updates to www.floridaredistricting.org coming soon! Updates to www.floridaredistricting.org coming soon! Over the next week or so we will be implementing some changes to www.floridaredistricting.org. With the launch of our Blog & Resources page, www.floridaredistricting.org is taking on a more simplified role as a front page for an entire universe of information about Florida redistricting. So what purposes will www.floridaredistricting.org serve in the near future? As we’re about to begin public input meetings on redistricting throughout Florida, www.floridaredistricting.org will provide updates and access to scheduling information. The site will remain the best access point to MyDistrictBuilder. The site will provide public outreach, participation and educational materials. The site will provide introductions to the legal and legislative sides of redistricting. The site will offer insight into MyDistrictBuilder, including user help and support. Beyond the content at www.floridaredistricting.org, the site will continue to serve as a gateway to an expanding universe of information, including social media, this blog and resources, legislative archives, and eventually access to the plans and suggestions submitted by Floridians. For example, as a visitor to our Plan Explorer page, you will be able to search and review redistricting plans and ideas submitted by other Floridians – blog, share, and use as a foundation for your own input. You will be able to take the redistricting plans and load them into MyDistrictBuilder, so that you can edit them, and resubmit them with your own twist on someone else’s idea. Crowdsourcing – Florida redistricting style! In the meantime, many of our resource links have moved here – to the Blog & Resources page. The resources on the right side of the page are geared towards what you might want for drawing or analyzing redistricting plans. The resources in the middle are focused on news and big picture items – why, what, how, etc. As our pages evolve, if you lose track of a favorite link or a resource, just email us at mydistrictbuilder@myfloridahouse.gov. And as always, feel free to let us know if you have any other questions or comments. Late 2010, staff of the House Redistricting Committee began contacting numerous organizations about MyDistrictBuilder and other opportunities to participate in Florida’s 2011-2012 redistricting process. If you would like the House Redistricting Committee to help get your group – or an organization that you know of – involved in the redistricting process, email the Committee’s staff at mydistrictbuilder@myfloridahouse.gov or call (850) 488-3928. Even if you just need assistance in how to get information about public meetings, MyDistrictBuilder and other resources to your organization, the team is happy to help! The document below lists the groups contacted thus far. Currently, staff are reaching out to these organizations a second time about the public meeting calendar. Now is a great time to add new names to this list, so that your organization has the latest details on this summer’s public meetings. The end of this week’s committee meetings will provide a turning point for the members of the redistricting committees – in which they go from learning about the redistricting process – to sharing with and learning from Floridians. Overall, the three recent weeks of meetings are intended to give committee members the foundation they need for all forms of public input on redistricting, including MyDistrictBuilder, and this summer and fall’s public meetings throughout Florida. Coming into this week, members of the committees have learned about many of the public participation resources available through www.floridaredistricting.org, which also provides public access to the beta version of MyDistrictBuilder. This week, committee members are listening to a tutorial on MyDistrictBuilder, but they are also receiving a tutorial (below) that they can provide to their constituents. The PowerPoint document was created so that Floridians could follow a learning process similar to the committee members themselves. The full 24 MB version of the PowerPoint can be downloaded by clicking here.